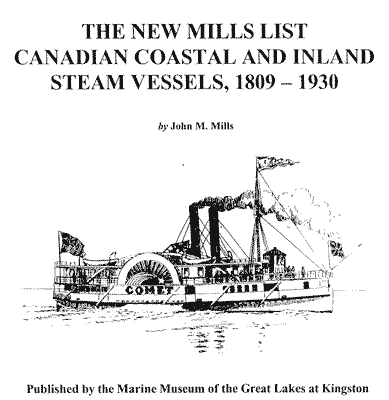 141x26x12 Owned by J. Proctor, Hamilton 1875; S. Crangle, Hamilton 1877; J. Ewart, Cobourg 1886; Montreal & Chicago Merchants' Shipping Co. 1893, 1895; to Battle Island Pulp Co. 1907. Built by W. Powers & Co. (Kingston Marine Railway) and launched 01/05/75. Engine 28x30 by Davidson & Doran, Kingston. Used Montreal-Upper Lakes. Lengthened to 177x26x12 by Muir Bros., Port Dalhousie 1883. Now had 30 staterooms. Sank 22/11/85 Alexandria Bay, New York., refloated.